You’ve been spoon-fed the same break-one-month-after-you-buy-em bearings since this whole thing started. We said “To hell with that,” and started making bearings our way because their way just wasn’t cutting it. That means a new bearing designed to go faster, roll smoother, and take more abuse. Sure, we’re going up against the biggest bearing manufacturers in the world. But if there’s anything that Detroit does better than anybody else, it’s doing what we shouldn’t be doing. You’ve been spoon-fed the same break-one-month-after-you-buy-em bearings since this whole thing started. 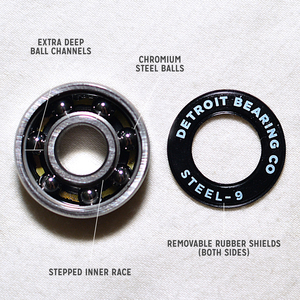 We said “To hell with that,” and started making bearings our way because their way just wasn’t cutting it. That means a new bearing designed to go faster, roll smoother, and take more abuse. Sure, we’re going up against the biggest bearing manufacturers in the world. But if there’s anything that Detroit does better than anybody else, it’s doing what we shouldn’t be doing.